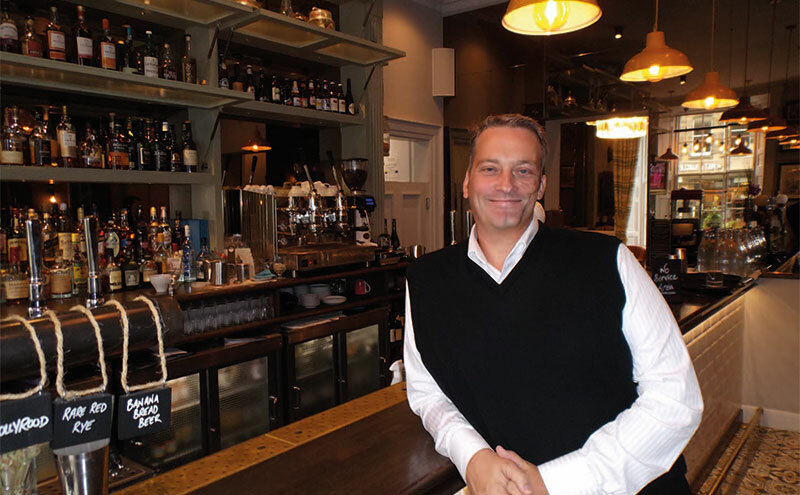 Acquisition trail: Nic Wood in Signature’s Edinburgh venue, Badger & Co.
IT’S likely to be a busy summer for Signature Pub Group and its founder, Nic Wood. Not only is the business preparing to launch a new venue in the former Church on the Hill on Glasgow’s south side and another later in the year on Edinburgh’s Grassmarket, but it has just acquired an additional seven venues after taking over Speratus Group, founded by Nic’s brother, Garreth. Garreth has now left the business and will be founding a new, philanthropic enterprise in the coming months. Speaking to SLTN, Nic said the integration of Speratus has been “seamless” as there was already certain synergies between the businesses; the two shared a head office and procurement was handled by Signature. “Some of them are trading very well, and there’s a couple that are struggling a little bit in the current climate,” said Nic. The Speratus units, consisting of four Boozy Cow restaurants – in Edinburgh, Aberdeen, Stirling and Dundee – Edinburgh pub Auld Hundred and Aberdeen venues Nox and Paramount, take Signature’s estate to 23 sites. Signature geared up for this expansion several years ago when it added to its senior management team and appointed area managers. Since then, the company has grown rapidly, more than doubling its estate in the space of three years after acquiring several sites from the defunct Maclay Inns group. Getting the right people on board was, said Nic, one of the most important steps to growing the business. “We’ve passed that hurdle of just being an Edinburgh company and we’ve gone out and made sure we’ve got the knowledge and the right people that can advise us on the different areas,” he said. “My issue was always never quite knowing some of the other areas as well as I know Edinburgh.